A friend asked to borrow my shotgun this spring for turkey hunting. At first I was reluctant but then realized that if I was going to be committed to getting one with my traditional gear it would be best not have it around to tempt me if I got discouraged. And that is exactly what was happening. I missed 3 toms the first week while trying to make a head shot on them. All my practice on golf ball sized objects wasn't working when it came to the real thing. Getting in close enough to shoot a woodland turkey without a blind is hard enough and throwing away all that effort with missed shots and spooked birds was getting frustrating. This week I decided I would body shoot the next one I got a chance at and rigged a string tracker to the bow. Yesterday I ended up shooting low and missing. Now I was doubting my skills but decided to blame the string tracker and remove it. I needed to just trust the bow and arrow to do their job. Today was a new story. I stepped from behind a tree to see a tom looking right at me from about 60 yards out. Seems I didn't look around as carefully as I should have. He didn't cut and run like I expected but he was nervous and headed away from me. Maybe he was one I missed last week and figured I wasn't a big enough threat to get excited about. Anyway, I stood still and watched him disappear in the underbrush. I scolded myself for getting careless and reminded myself how superior a turkey's sight is to that of a deer or my own. After several minutes passed with no sign of him I changed my position a little and made a few yelps on my wing bone call. I heard no response but figured I would just stay put since I now had good cover and threatening skies meant the hunt might be over soon anyway. Suddenly some movement caught my eye. It was a tom, perhaps the same tom, and he was heading my direction. This could be my chance if I didn't get noticed again. I tried to keep my body and bow concealed behind the oak next to me and then I focused on remaining calm and not moving anything but my eyes. He slowly made his way along, picking at this and that and always pausing to listen and look around. I knew I would have to let him pass by in order to get a shot but already my heart was picking up the tempo. As he passed behind my tree something caused him to gobble and I just about jumped out of my skin. He was probably less than 15 yards away and I wasn't expecting that. His was the first gobble I had heard all day. Moments later he gobbled again. I used that as my cue to lean out and have a look at him. Suddenly he fluttered his wings as if he was stretching them out and that was the commotion I needed to make my move. I stepped from behind the tree and drew simultaneously. My eye settled into the center of his back and the arrow was off. My aim had been true and the big bird tumbled forward. His beating wings told me the arrow had not broken his back and might actually be able to get away. I instantly was regretting the removal of the tracker and feared an escape so I rushed him. While running I pulled another arrow from the quiver and nocked it to the string. It was a field tip but for what I had in mind it would have to work. He paused for a moment as if to try to figure out why his beating wings had not taken him off the ground. His head came up and in a reflex motion I drew and released. The arrow struck the tom in the head just like it was one of those many, many practice shots at the golf ball sized objects. Now it was over. I had my turkey. A nice tom with a 9" beard and plenty of good meat for a turkey dinner. As I picked him up to go the rains started to fall. Hope to get to hunt some turky next year. From where I live it is a long trip to find one! Way to go! Nice Bird too! Congrat OW and great story. This will be my first archery season and I am doing it traditional. 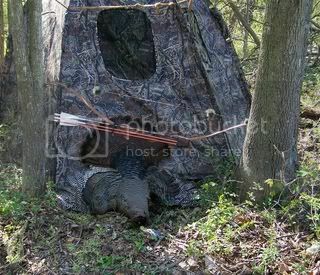 I hope to take a turkey sometime with my traditional selfbow. Congratulations on your first. If Chuck Norris were a boywer... well he wouldn't be because he can just roundhouse kick his enemies to death. Nice job heres my first trad turkey if it works. Nice!!! I'm still trying for my first bird and seeing pics of fellow trad shooting Michiganders is great inspiration.